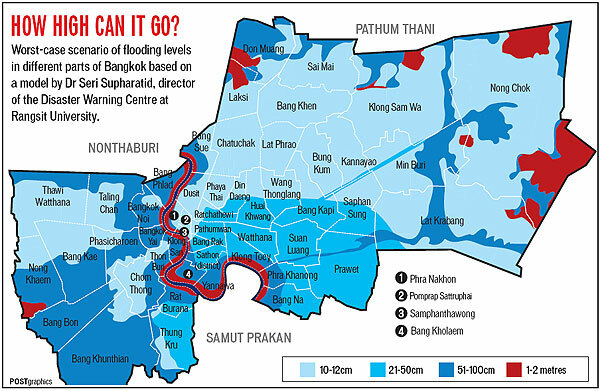 I am afraid that this image, reproduced from the Bangkok Post's website, is not a comforting one. I live in the Watana district of Bangkok and you can see it is calculated to be a rich turquoise zone ... i.e. it will be under about 9-20 inches of water. Although I prepared the house for a possible onslaught of 50 cm (about 20 inches) and therefore technically I am already prepared for the eventualities depicted herein, so far most predictions haven't been terribly accurate. Trisdee, meanwhile, is in the thick of it as a flood volunteer. If you follow his tweets @trisdee, you'll get a lot of good info. A map on the BBC showed the floodwaters will soon be released into Klong Sam Wa and straight through my living room. This weekend will be the decider. There is also the 'Yellowshirt Conspiracy' version of events going around, which I don't give much credence to. "Our Ways Are Not Your Ways"